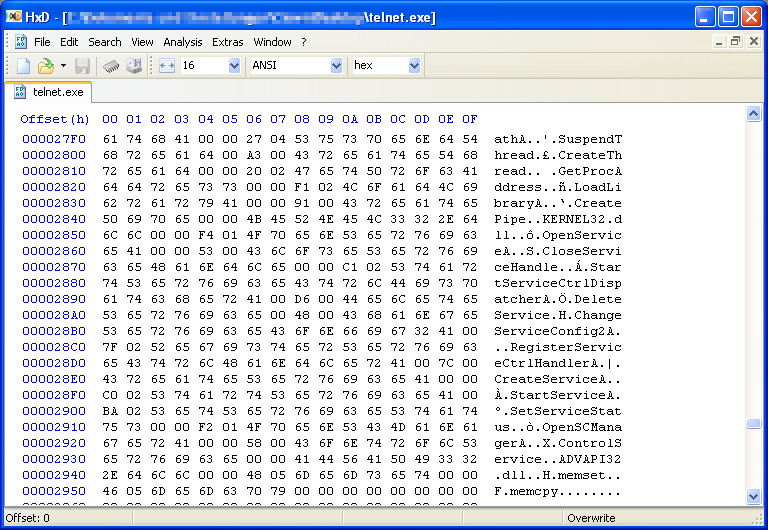 The File is a plain executable without an icon, a resource section (.rsrc) or any version information. It's also not obfuscated or packed in any way. 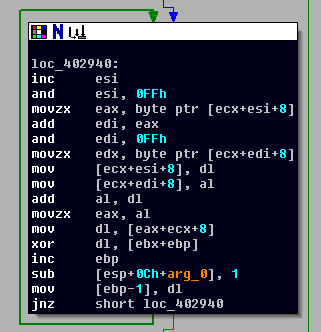 A quick look with a Hex Editor shows the Rich Header, so the executable was created with a Microsoft compiler. There are also some interesting strings, but more on that later. 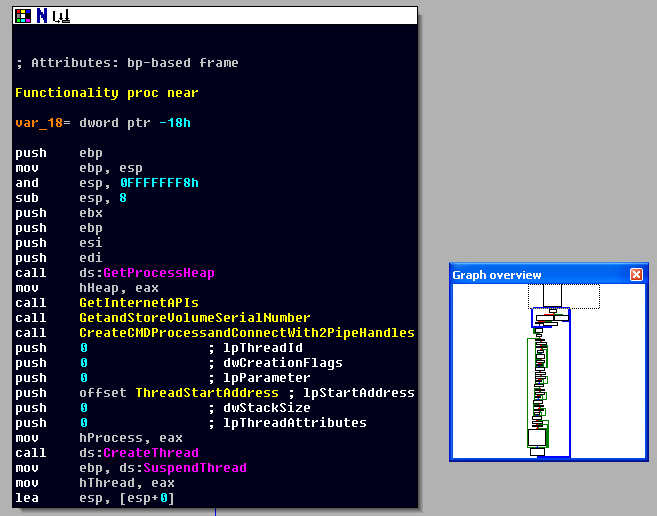 We see executable names (cmd.exe, services.exe), domain names (google.com, xlamzju-lrychj.info), HTTP transfer method strings (POST..., GET...), the Service name ("System Storage Service") and several other interesting strings. Now to the interesting part, so let's switch to the code Window and walk through the functionality of the Bot. If the "-install" switch was used than the Windows Service "System Storage Service" is created with the current path of the executable as the Service program (OpenSCManager() + CreateService()). Thereafter the Service gets started and the program exits. If the "-delete" switch was used the Service "System Storage Service" gets deleted (OpenSCManager() + OpenService() + DeleteService()) and the program exits. If the "-start" switch was used the Service "System Storage Service" gets started (OpenSCManager() + OpenService() + StartService()) and the program exits. If the "-stop" switch was used the Service "System Storage Service" gets stopped (OpenSCManager() + OpenService() + ControlService()) and the program exits. If none of the above arguments are used, the file is copied into the folder "C:\Documents and Settings\<username>\Local Settings\" with the new name "services.exe" (CopyFile()). Then the file attributes are set to "hidden" and "system" (SetFileAttributes()). Subsequently the Service "System Storage Service" is created with the new path C:\Documents and Settings\<username>\Local Settings\services.exe and started. Afterwards the program also exits. 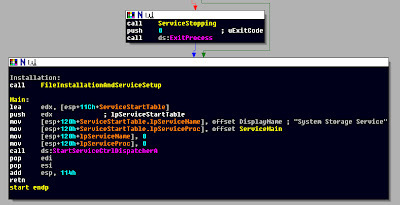 So how does this executable work if all its functionality is to create a Service and then exit? "When the service control manager starts a service process, it waits for the process to call the StartServiceCtrlDispatcher function. The service control manager uses this connection to send control and service start requests to the main thread of the service process. If a service runs in its own process, the main thread of the service process should immediately call StartServiceCtrlDispatcher(). 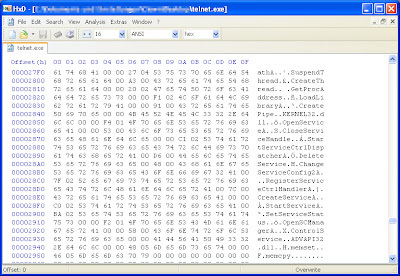 All initialization tasks are done in the service's ServiceMain function when the service is started." "The entry point for a service. When the service control manager receives a request to start a service, it starts the service process (if it is not already running). The main thread of the service process calls the StartServiceCtrlDispatcher function with a pointer to an array of SERVICE_TABLE_ENTRY structures. Then the service control manager sends a start request to the service control dispatcher for this service process. The service control dispatcher creates a new thread to execute the ServiceMain function of the service being started. The ServiceMain function should immediately call the RegisterServiceCtrlHandlerEx function to specify a HandlerEx function to handle control requests. 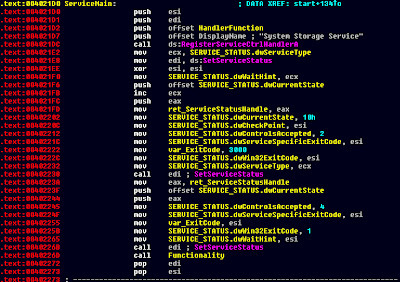 Next, it should call the SetServiceStatus function to send status information to the service control manager. After these calls, the function should complete the initialization of the service. Do not attempt to start another service in the ServiceMain function." So the ServiceMain function is the entry point for a Service, just like WinMain() for a Windows-based application or DllMain() for a dynamic-link library (DLL). No we follow ServiceMain in IDA Pro and end up in a bunch of random bytes. What's going on here? We see two function calls to RegisterServiceCtrlHandler() and SetServiceStatus() just like described by MSDN above. 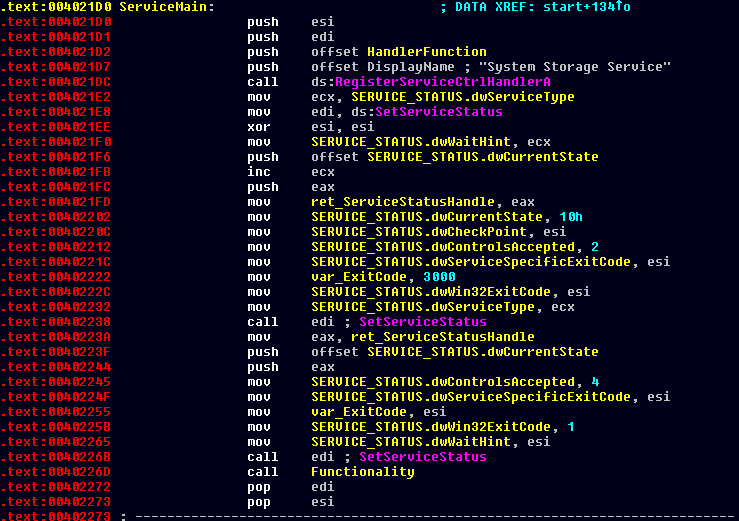 After a while of thinking I realized that IDA Pro hasn't recognized the ServiceMain function as executable code, so here we have to convert the bytes into code manually! After doing this we can continue our analysis. SERVICE_CONTROL_SHUTDOWN (0x00000005). Afterwards the Service gets set into its appropriate state by calling the function SetServiceStatus() and filling the elements in the SERVICE_STATUS structure of the Service. Now we go back to ServiceMain and follow the execution flow. After another 2 SetServiceStatus() function calls, there follows a single call ("call 004017B0") to the main functionality of the Service and thus of the Bot. Now it is getting interesting! 4) Create URL encoded characters: Check if the encrypted string contains non alphanumeric characters and change if so, e.g. the character "/" (0x2F) gets transformed into string "%2f" and character "+" (0x2B) into "%2b"
"Query failed: Access denied for user 'www-data'@'localhost' (using password: NO)"
"www-data is the Debian user that runs apache and php. If you attempt a query when you don't have a valid connection, php/mysql will attempt to create a connection using <unix-user>@localhost with no password. This is where www-data@localhost (using password:NO) is coming from. So I wasn't able to get an insight into what the C&C server does with the encrypted data and what is send back to the Bot. That's all of the functionality of Thread 2. Let's continue with main Thread. Set-Cookie: PREF=ID=6b71445b2dcdf21a:FF=0:TM=1326435415:LM=1326435415:S=PF-ekMf7WncK82rp; expires=Sun, 31-Aug-2014 17:50:15 GMT..."
By analyzing the HTTP status codes (200 OK, 302 Found) from Google response the malware knows if a internet connection is available. If no internet connection if available the Service sleeps for 30 seconds and tries again to contact Google and analyze the response. 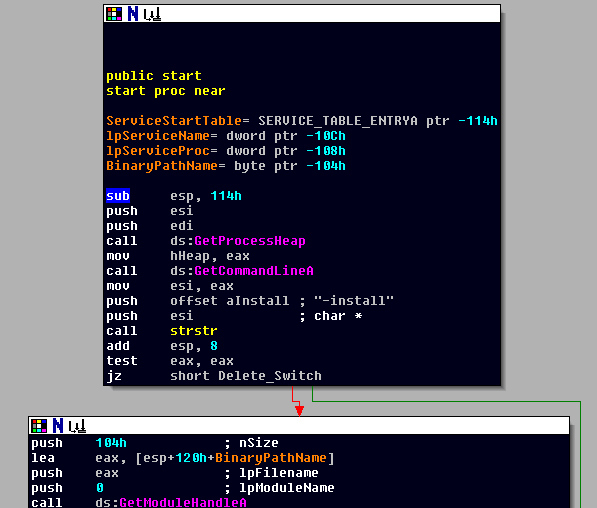 A command gets directly written to the Pipe which then gets read by the child process cmd.exe and thus executed. 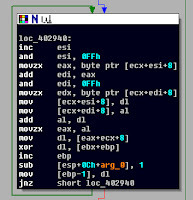 If one of the above commands was received, the malware sleeps for 2 seconds and starts again to probe for a internet connection by requesting Google (see above).